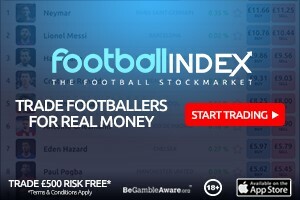 Football INDEX is football stock market, where traders can buy and sell shares in professional footballers with real money. The platform operates with all the characteristics of a stock market, with traders buying units of footballers building their football portfolios and trying to sell at a profit. You pay no tax on the money you make. 1 Fluctuations in player prices. 3. Match day rankings where there are four separate dividend opportunities in Top Forward, Midfielder and Defender, plus Top Overall Footballer. I’ll be concentrating on the first one which is to buy a portfolio of footballers that I think will increase in value, as a result of increased demand, which at some stage will enable me to cash out at a profit. Football INDEX is not a spread betting platform so the idea is that you can never lose more than your deposit. The price of a footballer is set by the demand for shares in that footballer. All footballers have a buy and sell price. The buy price will be higher than the sell price. There are two ways of selling. Either to the market or by going for an instant sell at the sale price. In both instances Football INDEX takes a 2% commission fee. Once you have made a deposit then you can begin trading. You can either trade in particular players or buy a tracker portfolio. If you want to cash out you can withdraw your funds as outlined on the site. The first thing to remember is that buying shares in players is not like making a bet for say a team to win or a player to score in a game where even the teams where you think they are nailed on to win will still give you a big instant return. So for example Spurs to beat Stoke was £1.33 for £1 invested. Aubameyamg to score against Southampton was £1.67. These instant returns aren’t what you will be looking for on Football INDEX the returns take more time but you don’t risk your entire stake instantaneously either like you do in those betting situations. Like anything the risk is less to your stake but the rewards in the short term are lower as well. So for me at the moment in learning about the format I have a portfolio of 45 players which I have been buying regularly for three weeks. My portfolio has increased over that time by just over 5%. If that continued over a year, if my maths is correct, I would get an 86% pa less, cash out costs, return on my investment. I’m not expecting that it’s just an extrapolation. What has been my player purchasing criteria? Firstly this has just been my approach and if you choose to play you must make your own decisions and be aware that prices can go up and down and do so at your own risk. Generally, I’m looking in the medium to longer term for gains not just an instant profit. One of the main drivers of price appears to be the prospect of a transfer to another team. Buying players on these rumours has seen some success. I’ve gone for Nicolo Barrela who’s supposedly had interest from Man Utd, Dani Ceballos of Real Madrid who Liverpool have purportedly shown interest in and Bruno Fernandes of Sporting where Spurs have been rumoured to be interested in. Richarlison and Riyad Mahrez are others who’ve been linked with clubs where I’ve gained. I’ve also looked at players out of favour at clubs who you think may move on in the summer. Alberto Moreno of Liverpool, Daniel Sturridge and Oliver Giroud are three I’ve punted on although little gain so far. I’ve also looked to buy players that have been injured in the hope that when they return they will improve in price. Benjamin Mendy, Nathaniel Clyne, Toby Alderweireld and Ruben Loftus Cheek have been 4. These have had mixed results so far and I expect Alderweireld is transfer rumour related. I bought some players I thought had good fixtures and would go on a run of form which has worked out well. 2 Arsenal players in Aubameyang and Ozil have benefited as has Zaha. I bought Ben Chilwell, Sam Byram and Oliver Burke. Seen little so far from them in price movement. I have no methodology for valuing players but I thought Kasper Schmeichel, Chris Wood and James Tomkins look good value at their price. So far little from those buys. What will FFGeek be doing? Here’s a screen shot of progress so far. I’ve just bought £50 worth of shares at the moment but have deposited an extra £100 to buy more players. Remember to gamble responsibly, over 18s only and terms and conditions apply.. Also Football INDEX have a number of restrictions you can put on your own activity. Follow us on twitter and facebook for article updates and news. Geek, is there a regulatory body?